This sample wedding ceremony script or “cheat sheet” is a simple, streamlined guide to performing a basic, standard marriage ceremony. 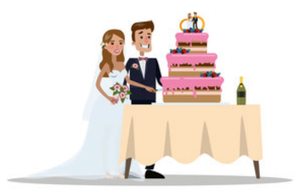 It is also included in your ordination credentials packet, and provides you with the framework for planning and designing a custom, personalized wedding ceremony with your couples. This is just a basic guide to get you started. Each ceremony is unique, so feel free to adapt the format to fit your situation. Feature photo (top) by Samantha Gades.